October Recap + $100 Amazon Gift Card Giveaway! Here we are friends – just a few short weeks until the holidays arrive! Could you use a little help with your gift shopping? I thought so. That’s why I’ve chosen a $100 Amazon gift card for my Reader Appreciation giveaway this month! These monthly giveaways are the best way that I know to show my appreciation for each one of you and your comments have been a great way for me to get to know you better. Entry couldn’t be easier – simply leave a comment on ANY post during the month of November and you are automatically entered! More comments = more chances to win! 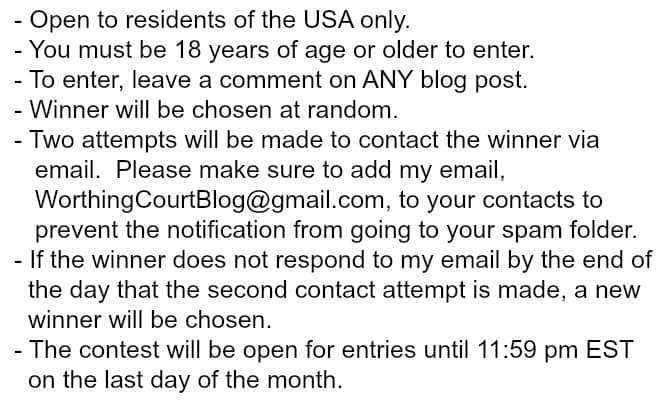 THE CONTEST WILL END ON NOVEMBER 30TH AT 11:59 PM EST. The month October was a busy one for me! Fall has been around for awhile and I have Thanksgiving on the brain. By the end of the month, I was pulling all of my Christmas decor out to go through to get ready for decorating. Here’s a closer look at what went on, in case you missed anything. Y’all, I’m sooo excited to be celebrating the first holiday in our newly madeover dining room! Tis the season! The season for decorating our mantels, that is. 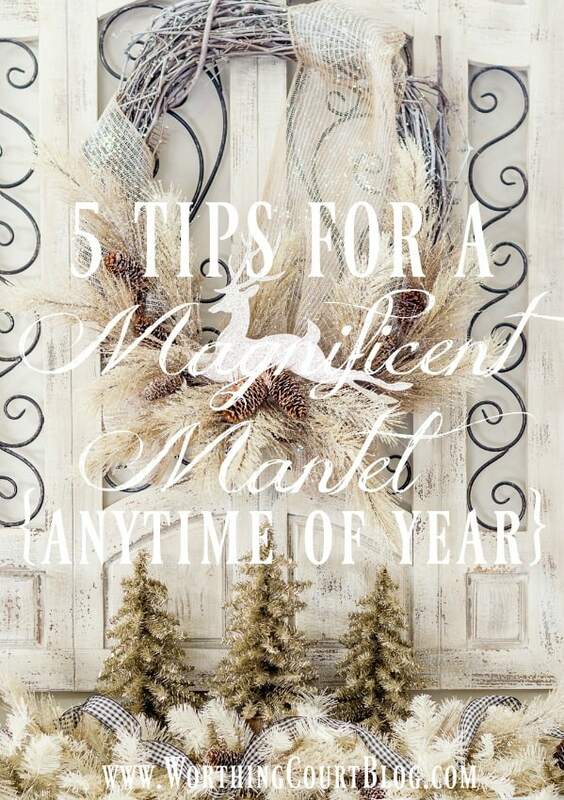 I have 5 tips that you can use for creating a magnificent mantel display any time of year! 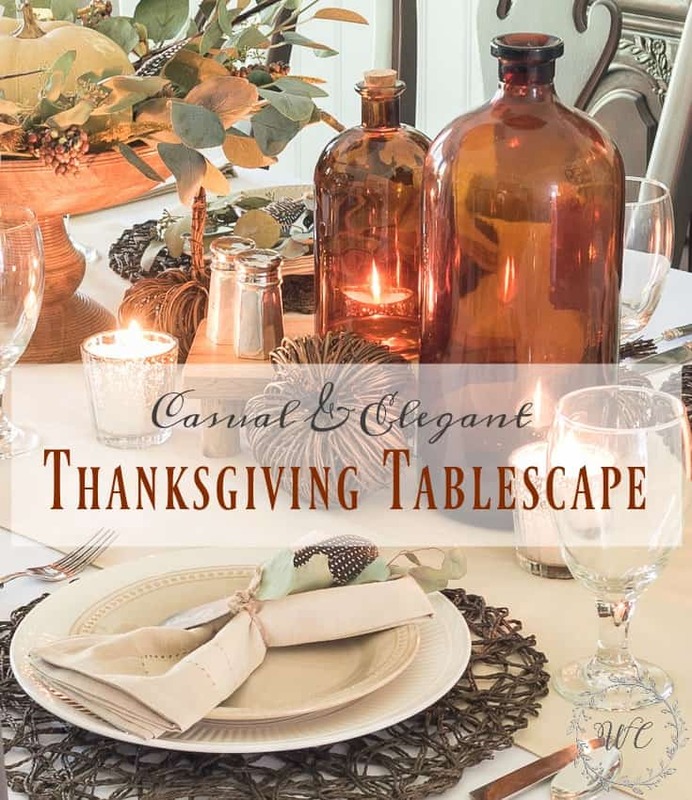 You still have a couple more weeks until turkey day, but you’ll have a much more enjoyable time if you prepare ahead! Will you be entertaining this holiday season? Now’s the time to make sure you have enough seating for everyone. I’ve done the shopping for you! If you love pumpkin, this is a recipe that you’ll definitely want to add to your fall, Thanksgiving and Christmas recipe list. 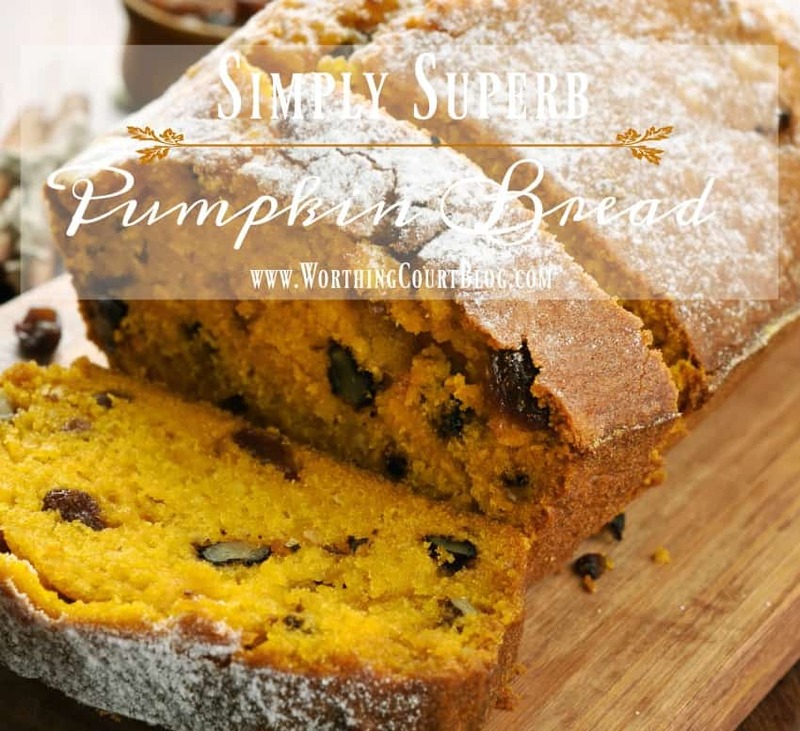 This Simply Superb Pumpkin Bread is the bomb! As we near the end of our office makeover, I’ve jumped ahead a little and completed my first project for the foyer! 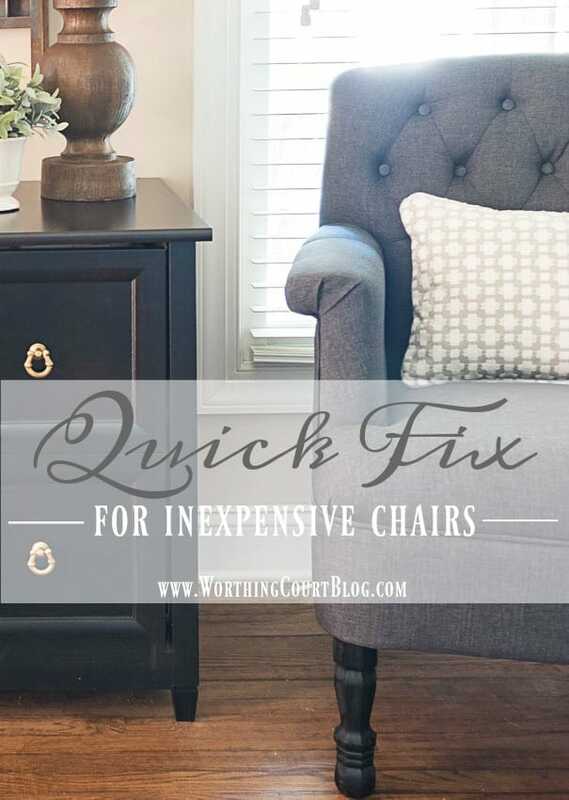 There are reasons why those oh-so-appealing upholstered chairs are so inexpensive. Let me show you how I fixed one of them! I enjoy reading your blog each day, and look forward to seeing what ideas you have for us. Thank you for the give aways each month. Who couldn’t use $100.00 around the holidays?! Thanks Suzy for the chance to win as well as the opportunity for inspiration!!! Thank you, Suzy, for your generous giveaway! LOVE your wreath with the white deer above your mantel Suzy! I may just have to copy it! Also, I do the same thing with the legs of chairs, benches, etc. when they are too low. I just purchased the same type legs from Home Depot this week to add more height to a new bench at the foot of our bed. $12.00 was such a quick fix for extra height! Happy Holidays!! I love some pumpkin bread. I’ll give your recipe a try. Okay, you’ve done. You’ve got me inspired to put a pumpkin or two here and there. I have been busy trying to play catch up with the yard. NOW! I’m ready to cook and decorate. You’ve got some really great ideas. I detest our dining room chairs! I wish I could get others that would fit our house better. Our chairs are big and clunky Early American. I truly hate Early American – it was never my style. Don’t get me started on how I ended up with them. 🙁 I’m using some of your tips. Hopefully, no-one else will notice the chairs. Have a great weekend and thank you for the opportunity to win the gift. Thanksgiving is the easiest holiday for me. My husband, 2daughters and son-in-law do the cooking. After dinner the grandchildren and daughters help decorate my Christmas tree. Love this day! I cook for them on Christmas. I still haven’t gotten over the tip about the chair legs which solved my problem in hunting a chair with enough height for my room – at a cost I can afford! I’m still looking for the exact chair but my options are so much better now! I can’t believe how this changes everything. What an ingenious idea. Thank you so much. I really enjoy your blog and your style. Oh boy, yea I could definitely use $100 gift card to help with Christmas this year~we have our very first grandchild!!! (Could possibly go a little overboard on my lil peanut, lol). And I LOVE the candlesticks you have shown in your last picture, they are gorgeous and I have some that I’m going to try to give that “look”. What a nice holiday surprise! Thanks for the opportunity to win and for all your wonderful decorating inspirations! Never miss a blog!! Love all your holiday ideas. Thanks! Thank you for the opportunity every month. Enjoy your blog very much. Love your decorating style. Very inspirational. I am so glad I found your blog. Enjoying it very much!! Thank you for inspiring me!! Love, love, love your redo ideas for each room. You have such great decorating style. I enjoy reading your posts each day. Would love a gift certificate! It is nice to get a recap of the month because sometimes I don’t remember to pin something I wanted. The holiday season is almost upon us! Thanks for the mantle styling tips! Thanks for the awesome chair tip! We are fairly tall, and have a chair we love and fits perfectly, except the low profile made it uncomfortable to rise from. . Such a brilliant simple solution! Appreciate your sharing it. Thanks for always inspiring me with your blog. Enjoying a morning with coffee and sifting through my favorites, yours being one of them. Happy Saturday. I always enjoy reading your blog and seeing all the inspiration. Thanks for the opportunity to put a little more sparkle to my families Christmas! i truly wish you were my neighbor so that you could help me decorate my home. the photos of your home and reno projects are all lovely. I love your blog and your DIY projects! This is the first time I have visited your blog. Looking forward to more holiday decorating ideas. 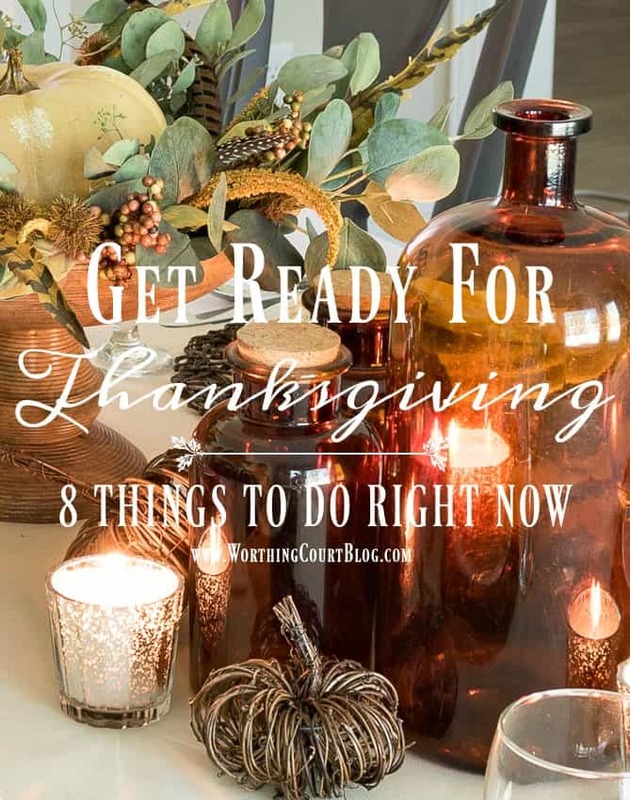 What a great summary – will help me get ready for Thanksgiving. This is great to share ideas and a great way to learn about us, too! I am new to the blog. Love the tablescapes!!!!! 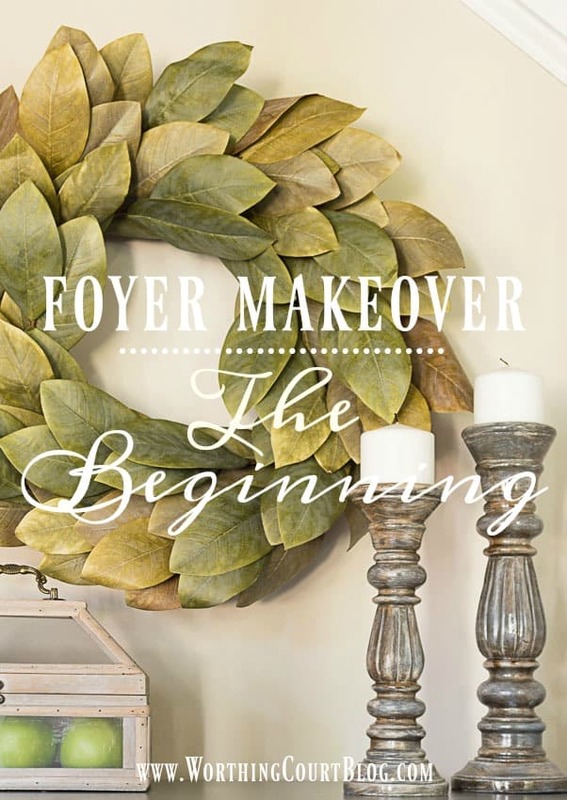 Love the progress you`ve made in your foyer. The chest is so much nicer in gray. I love the miniature trees so beautiful! Beautiful table – love it! You have such great ideas. I love the chair leg tip….I’ll be using that for sure! Would love to win this gift! Thanks for the chance to win a gift card….there are always things I want from Amazon – lol. Looking forward to all your Christmas ideas and decor. Love ”visiting” you in your lovely and welcoming home. Thank you so much for sharing your beautiful home with us! I absolutely love all your decorating ideas! Hope you have a great day. $100 Amazon card! Woo hoo! Entrance #1. Love seeing your blog and enjoy your tips! Thanks for all of the tips for decorating. I love this time of year and I enjoy seeing how others decorate for the holidays. I just love your blog! You have great taste, and really know how to decorate. Thanks for the mantel ideas. I am always looking for new ways to brighten my mantel. I made the pumpkin bread…….delicious and love by all. i love how all of your ideas are affordable. thanks for the generous give aways! Thanks for the yummy recipes! The pumpkin bread looks amazing and I love your Thanksgiving table décor. I love your passion for decorating. I have enjoyed seeing your makeovers with each room. You have so much energy. The pumpkin bread looks delicious. Thank you for the giveaway! And thank you for all the ideas over the years. Love the pumpkin bread….yummy. Thanks for the giveaway. Every bit helps with the holidays just around the corner! Love your site. You are inspirational! And… pumpkin bread… my fave! Thanks!! I look forward to reading your blog each day. Trying the pumpkin bread recipe soon. Thanks for a great blog. You always have something wonderful to share with your readers. Thanks for the opportunity to win a gift card from Amazon! I love your ideas! And I can’t wait to try your pumpkin bread recipe! I love the DIY project posts.. you’ve got some really good ideas! Love the pumpkin bread photo/recipe! I think I will have to try it. How lovely, an Amazon gift card. There are so many things I’ve seen in your blog that I wouldn’t mind having in my stash of unique accessories. I’m so glad I found your blog and signed up as a subscriber. Enjoyed the tips on mental decorating. Gave me some great ideas. One thing was i noticed i don’t have to change out every item. Example you kept your shutters and the center wall piece in most all of your mental photos. Thank you for the tips. I hope to make my tables looks just as great as yours. I just love your site. I get so inspired by your decorating skills. I went with a dark wall color in the dining room, I’m hoping to find new lamps and table linens in time for the holidays! Your pics help point me in the right direction. Love, love, love your tips for a magnificent mantel! Yours is absolutely beautiful! Love the ideas! Now to get ready for Christmas decorating! Love your Thanksgiving table! Great ideas…the brown bottles are unique! thanks for all the inspiration~! Enjoy your blog. I love my home and need ideas. You supply nice ideas!. Thank you. So many good ideas!!! So little time!! Love the farmhouse style! That’s what makes holidays with family comfortable and cozy, as opposed to stiff and formal! I’m trying to incorporate the modern farmhouse style into my own home this year, so it’s great to see things that I can “copy”! I love your decorating style and am using many of your Christmas ideas to decorate my home this year. Keep the ideas coming! The pumpkin bread looks really good….but the chair legs information is still my favorite tip! Love your decorating table ideas. Well, I must say I just love all your ideas. I love to click on your blog and see all the new ideas that you have. I do interior decorating as well as staging and you give me some great ideas. My customers love them also. Thanks for sharing them and keep them coming. One of the best Christmas presents I could get is you sharing ideas with all of us. Love the bookcase you posted last week! Thank you. I enjoy reading your posts. I appreciate the change to win the Amazon gift card. Christmas is near and it would be great. Thanks for all the great ideas on your blog…I have used your ideas in many areas of my home. 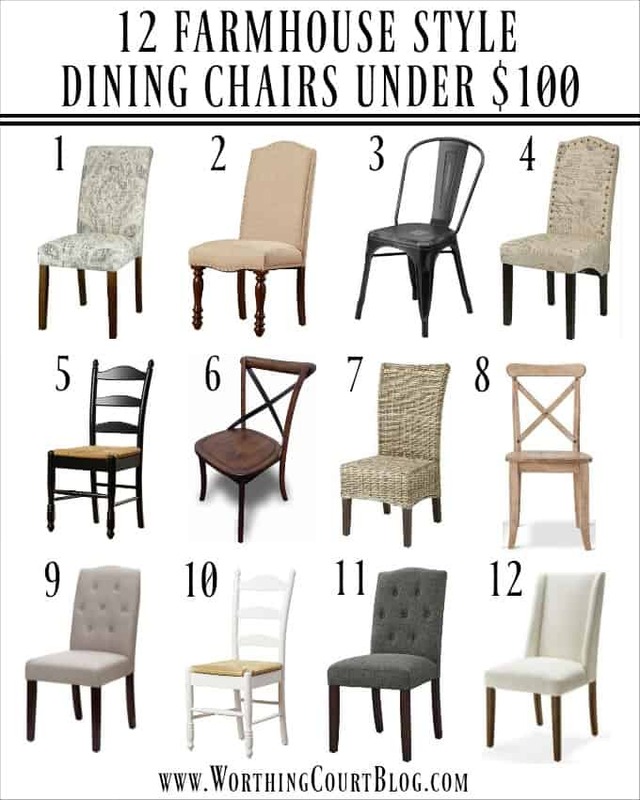 I actually put the dining room chairs for under $100 on my Christmas list!! Thanks for sharing your special talent! That is so generous of you! I am really enjoying your blog & DIY. Thank you! Great blog! I enjoy reading it. Happy Thanksgiving!!! Thanks for your daily blog. They are crammed full of ideas. I love your makeovers for each room. That’s some killer pumpkin bread! My family ate the whole loaf already, clearly I’m going to have to add that to my Thanksgiving list. I love the holidays and by the looks of it so do you. Excellent job. Love the colors combinations. Happy Holidays! I just started reading your blog a few months ago. I enjoy how you give little tidbits on how you came up with the idea. Maybe of your projects are easy and look so elegant. I love the lantern with a pine cone in a cup. I have several lanterns sitting on the floor with the same old Yankee candles in them and this year for Christmas they will have a cup with a pine cone. Now, I am searching for a few nice looking pine cones in the woods in Pennsylvania. I’m a new subscriber and am really enjoying your blog. Thanks so much for the opportunity to win a $100 gift card, and sharing all your awesome ideas! 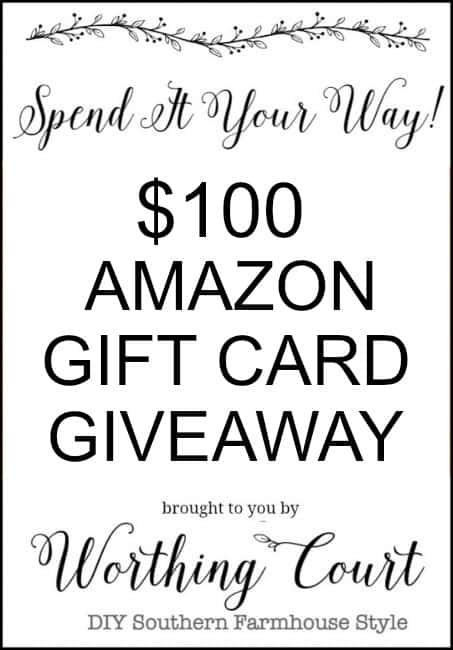 $100 Amazon gift card! Woohoo! Love your blog and all the wonderful ideas I gain from it. Thanks for the easy opportunities at giveaways too! the photos of your home are truly beautiful! you have inspired me to seek out holiday themed goodies for my home. thanks for the chance at your giveaway – happy holidays! Great ideas and beautiful pictures. Please keep them coming. Happy Thanksgiving. Love the use of feathers and lights…you have a wonderful decorating touch. Your Thanksgiving table is beautiful. I have been following your blog for years. Thanks for always having great inspiration! I made your pumpkin bread recipe and it was wonderful! Problem is, now I have to make it again for Thanksgiving house guests ’cause it’s all gone!! Thankfully it’s a n easy recipe. I love everything you do!! Thanks for all the delicious recipes and your design inspiration. I’m totally addicted! I love your blog! Every day I know I will get lots of great ideas & inspiration. Great giveaway! Suzy, when I read your blog, I already feel like I’ve won the design lottery! I have received a lot of great inspiration from you and I have a lot of plans for the future! I especially love your office. I have a desk very similar to yours and was wondering what color to paint it, and now I know! ? Keep it coming! Love, love love! You have good ideas… like the brown jars on the table and the magnolia wreath, which I want to make! I love the magnolia wreath. I used to live surrounded by fragrant magnolia trees. Miss them and wish they grew where I currently live. I like to collect pumpkin recipes and serve throughout the fall months. Pumpkin bread, muffins, pie, cookies all freeze so well and make perfect hostess gifts. Pumpkin soup, baked, risotto are all delicious and great additions to any menu. Plus, pumpkins as centerpieces in all varieties, shapes and colors are beautiful. Good Mix of ideas , products and recipes. Love your blog and your decorating style! Just printed the recipe for Pumpkin Bread. Sounds like it will be a hit on Thanksgiving! I was very attracted to your tablescape pictures. Caught my eye right off the bat. Very elegant but cozy looking. Now that the weather is a bit more cooperative here in Texas, just wish we could have the fall season a little while longer & not have to jump into Christmas decor right away. Keep up the beautiful posts…I look forward to each one! Have a Happy Thanksgiving Suzy. I enjoy reading your blog and look forward to what inspiration you bring forth for Christmas! Looking forward to your blogs! Hope you have a wonderful Thanksgiving Suzy! Happy Thanksgiving ! Thanks for sharing your style with us! Just now reviewing the “5 Questions from Readers” Post! Excited to find the long, yet still small, 3-sectioned cabinet for storing/displaying various small items in most any room! I have lots of art supplies, as well as clutter, and love pieces like this to help round up everything! Loved the chair fix, such good info!! Love the blog, has so many tips for us. Enjoy your tips and decorating ideas. Keep up the good work for all your fans. Love your decorating style & have used many of your ideas since starting to read your blog as often as possible! Thank you so much for your inspiration & Merry Christmas to you and yours!? Thank you for your generous Amazon giveaway! Inspiring, as always! Thank you! You always have some beautiful ideas! Love your blog!!!! Love your decorating ideas. Very creative. Loved you fall table arrangement. Excited to see you Christmas decor! Hope you had a nice Thanksgiving! Now we’re on to Christmas!! I have two “Frenchie” chairs in my living room that I love. Unfortunately the fabric split in a the seats and our sweet little destroyer kitty – Lucy – ate a whole in the pad on the arm (she also peed on a new lounge chair I brought into the living room but that is another story). I am trying to get up the nerve to fix them. Please keep sharing the ideas. Pretty as always! Thanks so much for the chance to win! Thanks for sharing your Christmas spirit? Would be delighted to win! Still love that white wreath on your mantel ~ really want to make something similar! Love your decorating ideas!! !and love your table arrangement. Where did you find that white garland on your mantle? Hi Mildred. I found the white garland at a local home decor shop’s after Christmas sale a couple of years ago.